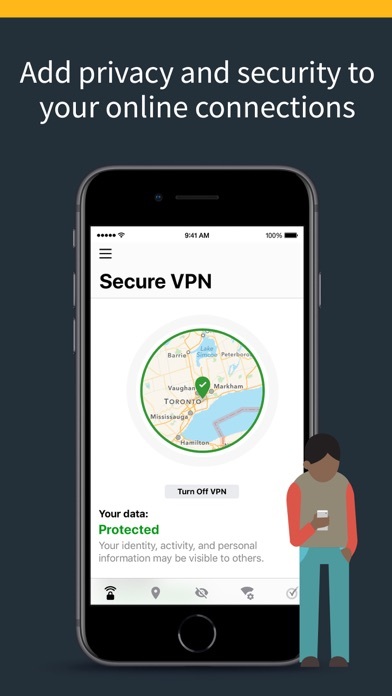 Norton Secure VPN is a security app from a consumer brand trusted by millions of consumers. 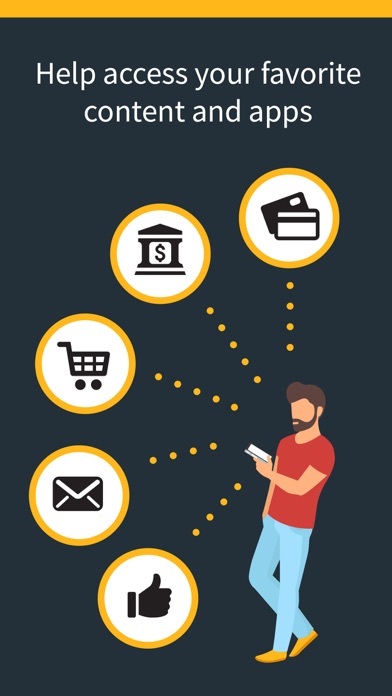 Protection for your device against cybercriminals, browse more anonymously, change your location, and helps block advertisers from tracking your online activities! Turn any public Wi-Fi into your personal hotspot! 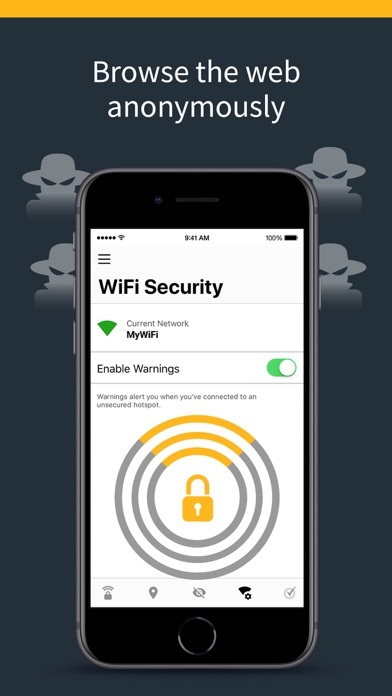 ► HELP PROTECT YOUR DEVICE FROM CYBERCRIMINALS When you connect to public Wi-Fi, cybercriminals may spy on your online activity and steal your sensitive information, like passwords and credit cards details. 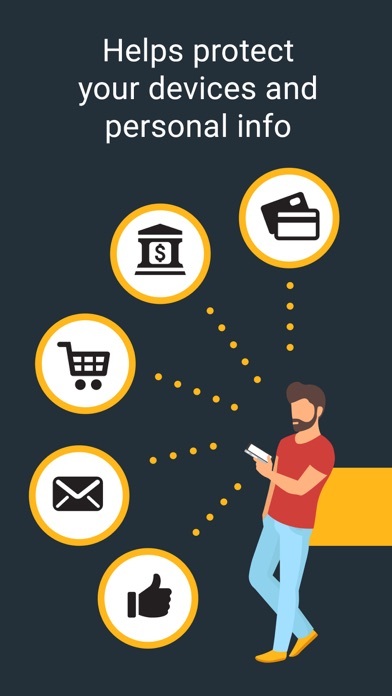 Norton Secure VPN uses the same encryption technologies that leading banks use to help protect your data. ►BROWSE ANONYMOUSLY Mask your online activities and location with our no-log VPN. We don’t track or store your online activity, so even we don't know what you’re up to! ►CHANGE YOUR LOCATION Just change your virtual location so your IP address can’t be tracked! ► BLOCK AD TRACKERS ADVERTISERS’ TRACKING COOKIES We help block ad trackers by intercepting cookies and removing your identifying information. Websites will no longer be able to track you to deliver unsolicited ads at a later time. ►TURN PUBLIC WI-FI INTO PERSONAL HOTSPOT Turn any public Wi-Fi into your own secure virtual private network to help keep your personal information safe, and your online activities private. ------------------------------ The KRACK attack puts Wi-Fi connections at risk. Use Norton Secure VPN to help encrypt the information you send and receive, for protection against this new threat. With Norton Secure VPN, you can pay bills at the airport or check emails at a café without worrying about cybercriminals stealing your passwords or monitoring your online activity. Going online in public just got better. Get Norton Secure VPN and go online in public, more securely and privately. 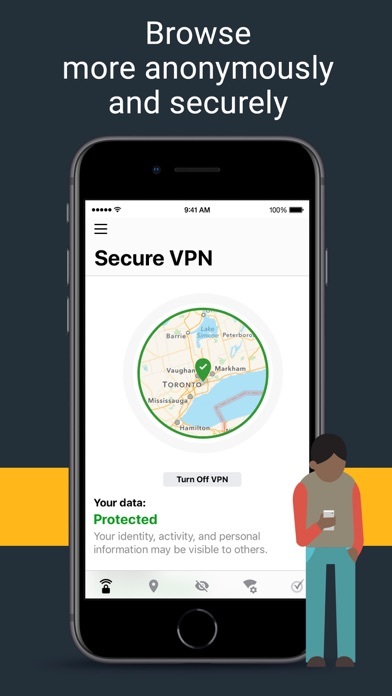 ------------------------------ ► SUBSCRIPTION DETAILS • Norton Secure VPN Subscription: Provides more secure connectivity for your mobile device. • 30-day trial requires activation of annual subscription. • Payment will be charged to iTunes Account at confirmation of purchase. • Subscription will renew automatically at the end of the subscription term unless canceled. Cancel in your iTunes account before end of trial to avoid payment. • Account will be charged for renewal within 24-hours prior to the end of the current period. • You can manage your subscriptions and automatic renewal may be turned off by going to your Account Settings after purchase. • Any unused portion of a free trial period, if offered, will be forfeited when you purchase a subscription. • Annual subscription is for one device only. 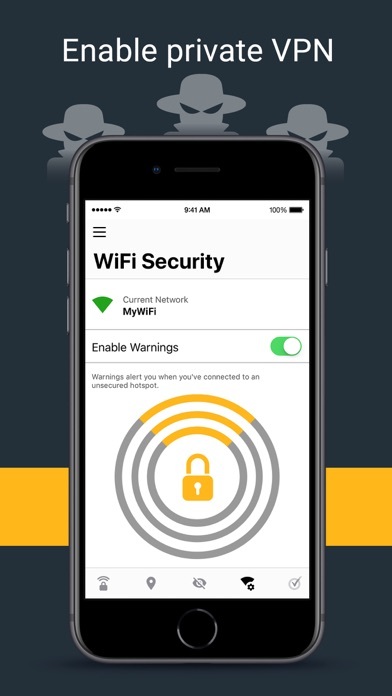 --------------------------------------------- For feedback and suggestions, visit the support forum: http://www.norton.com/wifi_support For a detailed list of features, visit: http://us.norton.com/wi-fi-privacy --------------------------------------------- •Start your 30-day trial* to help protect your Wi-Fi connections now! *30-day trial requires activation of $29.99 annual subscription. Cancel in your iTunes account before end of trial to avoid payment. More details below. This app is pretty good if you have a norton subscription. What trash this is. Why can I not use a FREE vpn instead of a yearly bill cycle? I randomly check the VPN to see where I'm connected through. Inevitably it will say Culver City CA. Even if I chose UK. I’m on ios... Whats up with that? Nearly every time I am not connected to WiFi, I have to reboot my phone to establish an internet connection. This is extremely irritating and time consuming fir something that is supposed to make my phone more secure without hampering its use. Norton Ad Blocker: Browse faster. Eliminate ads.